Born in a small Southern California coastal town, Timothy Leary learned to hold a fishing rod before he learned to write. By the age of 15, this seasoned fisherman was winning the jackpots on fishing trips for Albacore, Yellowfin and Bluefin Tuna, Yellowtail and Dorado. When he wasn't fishing, he was creating elaborate drawings of fish and ocean seascapes. A hunting accident at age 16 left Timothy partially paralyzed. Resultantly, Timothy has had to face many challenges. Through his determination to succeed and the strong support from family and friends, this award-winning artist has had his paintings included in private and corporate collections around the country and sold through galleries in Washington, D.C. and Alexandria, VA. Timothy has exhibited in many juried and group showings in California, Rhode Island, Maryland, and Virginia, garnering a strong following of dedicated collectors. Timothy honed his professional techniques as an illustrator and sign painter for the U.S. Department of Defense. Since moving to the Mid-Atlantic in the late 1990s, his work has been met with strongly gratifying success. 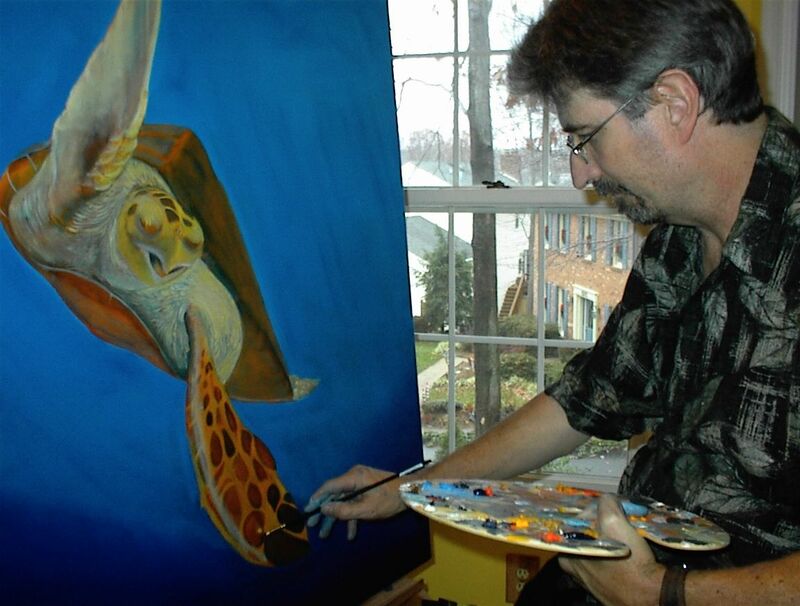 An the invited Featured Artist at the 2003 Tidewater Fresh and Saltwater Fishing Show, the Mid-Atlantic's largest fishing expo of its kind, Timothy supplied the Coastal Conservation Assocation (C.C.A.) with their special Show Print, helping to raise hundreds dollars in new membership dues and signing and distributing 1,000 prints to avid fishermen and outdoor enthusiasts. Timothy Leary's clever use of light and shadow create a sense of drama and tension in his wildlife art. His use of vivid saturated colors have evoked such comments as "new and refreshing" from art magazine editors, distinguishing his artwork with strong visual appeal. Working with acrylics on clayboard, canvas and plexiglass, Timothy uses many of the same glazing techniques that were used centuries ago by the Old Masters, layering translucent colors upon one another until the color has been built up to achieve the depth and vibrancy that allows the painting the illusion of light from within. Timothy now uses his artwork to raise awareness and money for wildlife and environmental groups that seek to conserve and protect the environment and promote principals of sound environmental stewardship. It is the artist's sincere hope that the viewer of his work will feel the same strong emotions and dedication to the preservation of our earth's environment that he feels while creating his art.